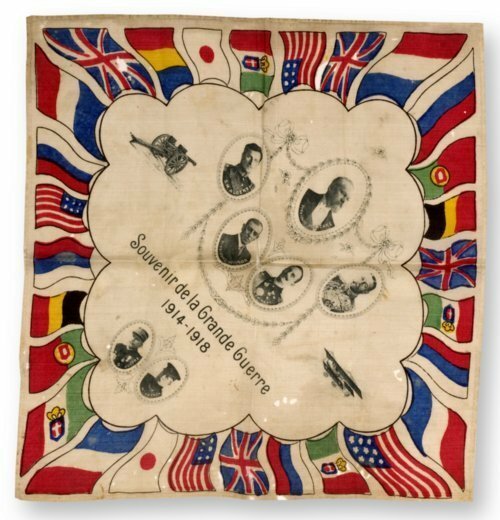 Souvenir silk scarf acquired in Europe during World War I by Emporia-native Arthur Joseph Ericsson (1889-1986). The scarf features images of Allied war heroes from World War I, including: French President Raymond Pioncare, King Albert I of Belgium, King George V of Great Britain, French Field Marshal Joseph Joffre, British General John French, and United States President Woodrow Wilson. The scarf also depicts a French Farman airplane and 75mm French cannon. Following the war, Ericsson gave the scarf to his niece. Ericsson was born in Emporia, Kansas and enlisted in the Kansas Army National Guard in 1912. He served in both World War I and World War II and achieved the rank of colonel. During World War I, he was awarded the Purple Heart medal for wounds received in France during the Battle of the Argonne. Ericsson returned to Emporia and served as a state legislator.